The following article is translated from Permanente Revolution No. 1 (Summer 2017), published by the League for the Fourth International. To order a copy of Permanente Revolution, send an e-mail to permanenterevolution@posteo.de. 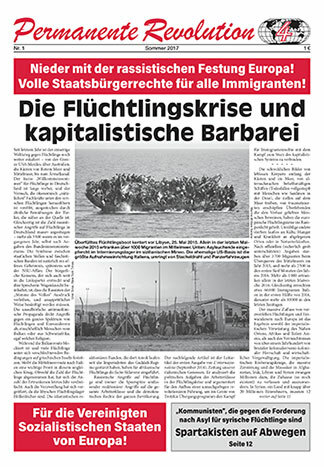 With this first issue of Permanente Revolution, we are introducing the German-language newspaper of the League for the Fourth International (LFI), which fights for international socialist revolution on the Marxist program of V.I. Lenin and Leon Trotsky. It is precisely this perspective, proclaimed by the Bolshevik October Revolution of 1917, that is today the only hope of mankind in the face of the spectacular decline of the imperialist-capitalist system of war, economic crisis and poverty. 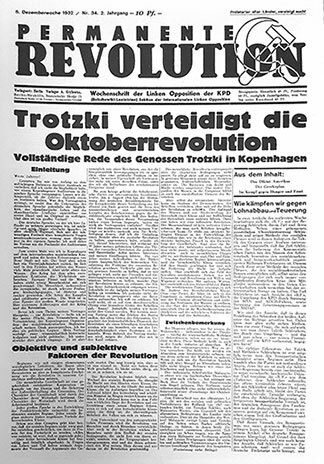 We take the name of our newspaper from the weekly paper of the German Trotskyists in the early 1930s. The Bolshevik-Leninists, as the Left Oppositionists in the Stalinized German Communist Party (KPD) called themselves at the time, fought tirelessly for proletarian united-front actions of all workers organizations to stop the Nazis. This stood in stark contrast to the KPD leadership, which first declared the reformist German Social Democratic Party (SPD) a “social-fascist” twin of the Nazi party, then turned around and proclaimed, “After Hitler us!” They ended up pushing an underground “people’s front” with a mythical progressive wing of the bourgeoisie. After the KPD’s capitulation without a fight (not to mention the SPD’s) and the complete absence of opposition to this in the Communist International, it was clear to the Trotskyists that the Comintern was politically dead, and that building a new, fourth International was on the order of the day. Founded in 1938, the Fourth International stood for defense of the Soviet Union against counterrevolution from within and without, and for a proletarian political revolution to replace the Stalinist bureaucracy with workers councils (soviets) under revolutionary leadership. Following the privations caused by the Civil War and imperialist military intervention, as well as because of demoralization due to the absence of successful revolutions in the economically more developed countries, the world’s first workers state degenerated under Stalin. The bureaucracy led a political counterrevolution and usurped political power, but had to maintain the foundations of the collectivized economy from which it siphoned off its privileges. With its anti-Marxist, nationalist dogma of building “socialism in one country,” Stalinism opposed the internationalist policies of the Bolsheviks. While the Stalinists betrayed a series of revolutions on the alter of the popular front and “peaceful coexistence” with imperialism, the Trotskyists fought for revolutionary class independence and proletarian solidarity. When after years of undermining the consciousness of the working class, Stalinist rule succumbed to the imperialist offensive in 1989-92, genuine Trotskyists stood at their posts and fought against the counterrevolution that destroyed the bureaucratically deformed and degenerated workers states, from East Germany (DDR – the German Democratic Republic) to the USSR (Union of Soviet Socialist Republics). At that time, and also today, the pseudo-Trotskyists stood on the side of imperialism with their “democratic” alibis. Today the League for the Fourth International fights against the restoration of capitalist rule, whether through imperialist blockade and attack or by internal counterrevolutionary forces, which menaces the remaining deformed workers states, from China and North Korea to Vietnam and Cuba. Another key programmatic pillar of the Fourth International was Trotsky’s theory of permanent revolution, which holds that in countries with belated and uneven capitalist development, to win even the most basic gains of the bourgeois revolution requires that the working class take power and extend the socialist revolution internationally. The devastation of the Second World War and the all-round murderous repression to which innumerable Trotskyists fell victim weakened the Fourth International. Thereafter, between 1951 and 1953, it was plagued by the revisionist tendency of Michel Pablo, who denied the necessity for a Trotskyist leadership. This led to the organizational dissolution of the Fourth International. We of the League for the Fourth International seek to reforge it on the basis of the revolutionary political continuity upheld first by the U.S. Socialist Workers Party under James P. Cannon, and then for three decades by the Spartacist tendency/International Communist League. The consequences of counterrevolution in the DDR and USSR had a demoralizing effect on the ICL, which tenaciously fought against it, and led to a sharp internal fight in 1995-96, beginning in the German section, the SpAD (Spartakist Workers Party of Germany). In response to the counterrevolution, which was a severe defeat for the proletariat worldwide, the ICL drew defeatist conclusions and claimed that it was the Stalinist bureaucracy, not the imperialists, who led the counterrevolution. The ICL thus repudiated the Trotskyist understanding of the contradictory nature of the parasitic bureaucratic caste. Later, after a series of internal fights against the increasingly social-chauvinist line of the ICL leadership over the refugee crisis (see “Strange Encounters with the ICL,” The Internationalist No. 44, Summer 2016), one of the “deviationists,” a longtime member of the editorial board of Spartakist and of the Berlin local leadership of the SpAD, left the ICL in December 2015, after all hopes of some kind of self-reform of the ICL proved to be definitively illusory. Shortly afterwards, comrades in the Spartacist League/U.S. section of the ICL declared a faction. The Better-Late-Than-Never Faction demanded: “Return to the Road of Genuine Spartacism! Regroup with the IG/LFI on the Basis of Their Revolutionary Continuity!” (published in a special bulletin together with the declaration of former leaders of the Italian section of the ICL, “Back to Trotskyism!”). After the BLTN comrades internally submitted their declaration of faction, they were forthwith bureaucratically expelled on the very next day. Leading up to a fusion a few months later, the expelled comrades made an “Agreement for Common Work” with the IG to “Work together exploring further opportunities to win people from the ICL milieu to authentic Trotskyism.” This newspaper is in good part a result of that work.